the whole thing looks absolutely great . that really would be fantastic and very generous of you looking forward to it. Truthfully? I think it may be ambitious for a first project... but Zthee's TTSH comes on a complete single board (except for the 3 VCO modules), so it's certainly easier to do than messing around with separate boards (23 PCB's in mine!). Looking foreword for the ody and the 2600 files. Cause of you I become a big Arp fan! Thank you for revealing the Arp world to me! Still have a problem with the VCF mixer - distorting! I've increased the input resistors from the standard 100k to 330k (to compensate for the fact that I've swapped the 4012 for a 4075)... just wondering if I should take them up to 680k or more as on the Odyssey (0-5v waveforms, but 0-10 or +/-5 for the 2600) or ditch the passive mixing and put an op-amp in there... no cigar yet. if i understand correctly you dont want to raise the input resistor cause of the low V, is it right? How do we increase the signal of the Oddy VCO? Is there a resistor that can be replaced or something? I think this is what you want. 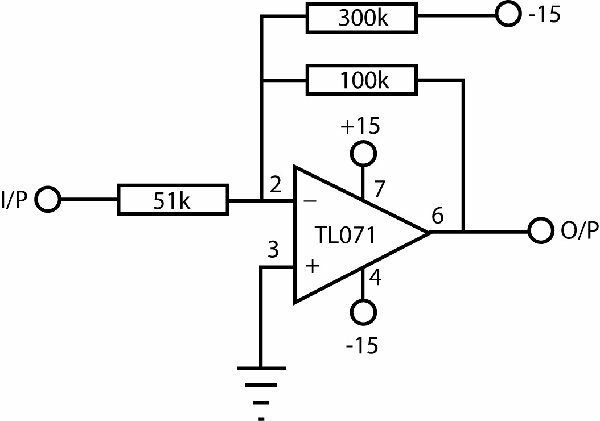 I've lifted this from Thomas Henry's Build a Better Music Synthesizer - it's from his CEM VCO design. He used it on the Triangle output (which is also 0-5v PP) to convert it to 10v PP centered around zero. I haven't tested it, but in theory it should be fine. BTW, I've just taken a look at the 4023 VCF PCB foil I posted... definitely the same version as I've used to build my own VCF's. I wish I could be more help - could you PM some high rez images of your board to me, I'll see what I can do. would it just be a case of changing the value of the 100K feedback resistor? Yes, I'd change the 100k resistor for a 51k and then follow it with a 50k trimmer to allow the voltage to be adjusted back down to 10v PP. You may find that it's not *exactly* centered around zero, though it'll probably be fine for general use - otherwise I *think* you would need to change the value of the 300k resistor slightly. Just found out that it wasn't the VCF mixer that was the problem... I was using a 15v gate from my modular for the AR envelope, which in turn was pushing the VCA too hard... DUH! Dropped the gate voltage down to 10v, now sounds great... I LOVE the ADSR exp control of the VCA, it really give the amp a kick. The only real problem I had was with the VCF - I didn't like the 4012 (Sorry to say this, but I'm a bit fed up with the Moog VCF hype, it's everywhere now) and replaced it with an Odyssey 4075 (which I had to botch to get to work)... I still wasn't 100% happy with the result, So I ended up searching for details on the 2600's 4072 VCF - not a lot of info available! I ended up copying the tracks from a pretty bad photo of the back of a genuine 4072 module, then painstakingly sorting out where the components should go from the schematic that's available. I was disappointed when it didn't work, but eventually (after 3 days) found that a 2N5459 had found it's way into my bag of 2N3906's causing the exponential pair to be duff. Looks a beauty, for sure sounds a beauty! What a beauty! Good job! orsm work we should all be in awe. I actually think your way of doing individual boards is better. With one board it could get screwed up bad enough to have to scrap the whole thing. With individual boards only the module that is hosed can be replaced. There are going to be a few hobbyists whose skills won't be up to what's required for this project and will probably trash their board. I just checked out your pictures on Flickr and you do fantastic work! 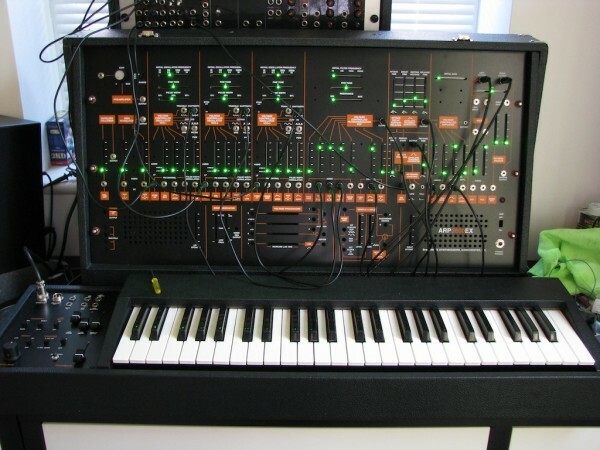 My DIY ARP-2600 works very well but but can't touch the panels and cases you have made...excellent! I just made four 4035 filters for a current project from your layout and they work great. Thanks for posting your DIY projects! Thanks for your kind words Theff, much appreciated. I set out 5 years ago with the though of building one, but didn't have any clue where to start - That's when I started dabbling with Odyssey VCO's etc and realised that it was a possibility. I'm currently working on the 3620 duophonic keyboard clone (the controller I've built is "ok", but just not quite right). Unfortunately, I had to pay a fair amount for decent and clear documentation as the available schematic downloads for the 3620 are unreadable... It should be completed by the end of the week, but I'm a bit concerned about what capacitors to use for the keyboard S&H. Standard metalized poly caps work well in the 4015 S&H module, but I'll have to see if they're good enough for the keyboard. Styroflex or Silvermica? Alternatively, wima has a line of caps intended for applications involving short pulses, not sure what parameter is optimised in these. Checked and those are the fkp1, not really suitable, big, and aimed at high power electronics. 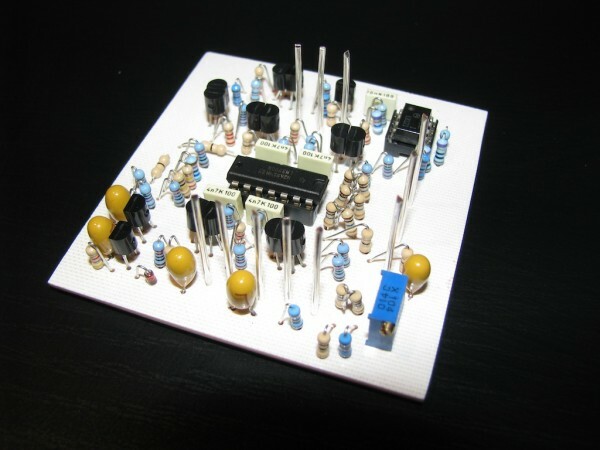 Rushonline capacitors are a good source for these and close to you. I'm currently using a good quality metalized poly, which seems to work ok, I've just got to sort out a slight problem I have with the upper voice generation circuit (not scaling to 1v/oct)... I thought I'd just need to change a few resistor values to bring it in line, but it's having a knock-on effect to the main lower voice cv out. Yup, they're big... The original 3620 Keyboard used BIG Polycarbonates, the polyester ones I'm using are fine for testing, but the voltage drop over time is not really acceptable. But, at least I found the problem I had with the second voice CV scaling... It's the keyboard I used (converted from a matrix scanner - the carbon switch pads introduce too much additional resistance when a second note is played, causing havoc with the resistor chain). I tested the PCB with the keybed from my Odyssey and it works fine... Looks like I'm going to have to build my own with J-Wires etc or get two MIDI CV converters - one low note and one high note priority... I can't see either being easy. so they are the bendy wire types. good for low note priority using rays circuit hmm but you want upper and lower note priority . so just a simple resistor chain based system wont work. However maybe 2 resistor chains running opposite directions to each other could be utilised if you could come up with a way of preventing the second note on each being involved for each one , thinking lots of magnetic micro reed switches so probably painful to implement and to set up. 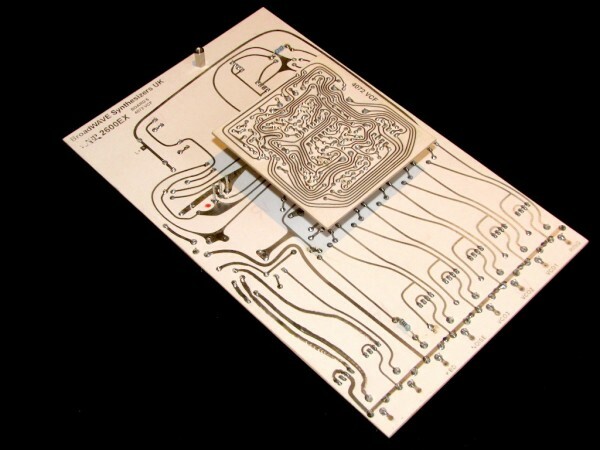 Just bought some silver conductive paint - apparently less than 0.2r per cm, so I'll give that a try on the PCB pads and bubble contacts. The ARP 3620 keyboard is duophonic from a single resistor chain - It derives the upper voice by detecting the voltage difference between the two notes played... that voltage difference is passed though a standard S&H and then mixed with the lower CV to produce the second upper voice - quite a simple but elegant design.